Francois Venter has been one of the Springboks' standouts. Photo: Gallo Images. A clean sweep of results against France in June on home soil, followed by back-to-back victories over Argentina in the Rugby Championship gave many fans hope. After a mixed bag of results for the Springboks in 2017, just how important is the outcome of today’s final Test of the year, against Wales in Cardiff? A clean sweep of results against France in June on home soil, followed by back-to-back victories over Argentina in the Rugby Championship gave many fans hope the Boks had turned the corner after an ordinary 2016. But a hammering at the hands of the All Blacks in Albany soon cast doubts over whether South Africa were on the right path, even though they picked up two draws – home and away – against Australia. A narrow loss to New Zealand in their final match of the Rugby Championship, in Cape Town, once again gave supporters hope ahead of the end-of-year northern hemisphere tour, but that quickly faded after a miserable opening tour match against Ireland, in which the Boks were woeful and their game plan and skills horrendous. Wins against France and Italy have spared their blushes for now over the past two weeks, but a strong Welsh unit lies in wait today. It’s almost a case of coach Allister Coetzee is damned if he wins today, and damned if he doesn’t. Coetzee had a dreadful 2016, when the national team won only four of 12 Tests, and although South Africa have only lost three from 12 Tests in 2017, the actual performances of the Springboks do not inspire confidence – with just two years to go until the 2019 World Cup in Japan. Since it was announced Rassie Erasmus would return in a new role as Springbok director of rugby, the rumours that Coetzee is on his way to Japan from next year have grown louder and louder. It’s been mentioned that Erasmus will play a more hands-on role with the Springboks and that the SA Rugby Union could hand Deon Davids, coach of the Southern Kings, a job with the national team. Fans would dearly love a win in Cardiff today. 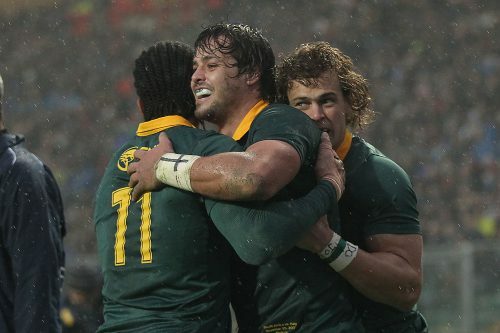 But the question still remains: how important is this Test in the bigger picture of South African rugby?